Starbucks has kept on top of trends so well that the origin story of the brand has lost relevance to the consumer. This rich brand history and heritage has been especially hard to convey at shelf in club, where there are already other barriers for purchase, including a larger pack size and premium price point. 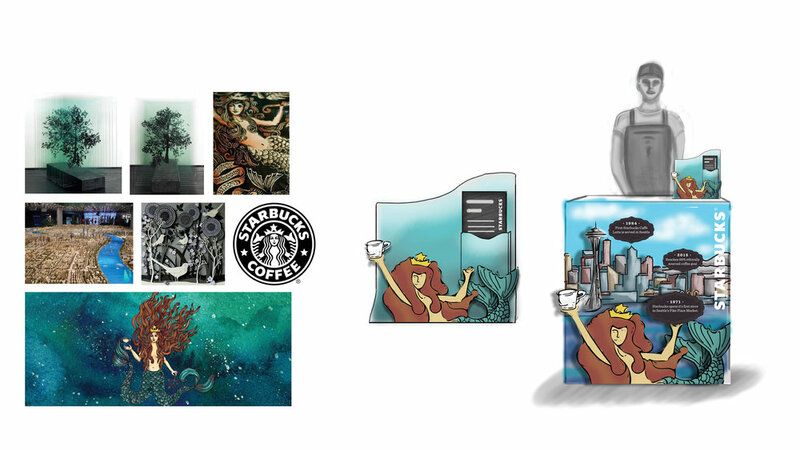 This concept featured the Siren as a brand storyteller. Using her as a beacon for shoppers, the interactive pallet display would become an AR experience that would remind them of Starbucks' roots in Seattle as well as their brand origin story. This demo cart featured a demential display that would educate the shopper on more about the Starbucks brand origins. Finally, the take one handed out at the sampling event would provide more information about the history of the roast that was sampled in an AR format that customers could experience at home and share online.